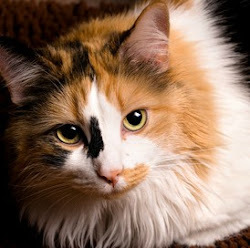 Thomasina's Purrls Of Wisdom About Cats: Can Cats Eat Dog Food? Can cats eat dog food, Thomasina? My cat likes the dog's food better than her own. Ugh. Dog food is about the last thing I'd want to eat. But it's okay if cats eat dog food, as long as it's just a bite or two and they eat cat food too. 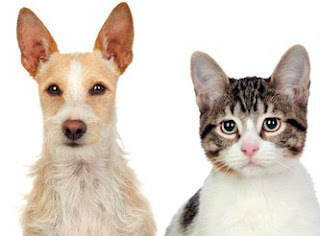 Cats and dogs have different nutritional requirements. And when cats eat dog food and nothing else, they're not getting the nutrients they need to be healthy. Cats are obligate carnivores and need to eat protein from animal sources or meat. Dog food doesn't contain nearly enough animal protein for us. One of the reasons our meat-based diet is so important for us is that protein from meat contains taurine. Dogs can make their own taurine, but we can't. We need to get it from our food. But some kinds of dog food contain no taurine at all, and that makes it dangerous for us. Cats who don't get enough taurine can develop all kinds of health problems, including heart disease, blindness and deafness. Okay, so my human typist looked this up. Dog food doesn't contain the arachidonic fatty acid found in animal fat either. But we really need that to maintain our coats and keep our kidneys healthy. And we need more niacin, thiamine, and folic acid than dogs do. The easiest way to keep your cat away from the dog's food is to feed the dog twice a day and not leave any leftovers sitting around for the cat to eat when she needs a snack. Instinct tells us to eat between 10 and 15 small meals a day. But dogs usually scarf down all their food in a few minutes, so limiting the dog to two meals a day shouldn't be a problem for him. Just put your cat's food on a shelf or counter so the dog can't get to it. Cat food isn't any better for dogs than dog food is for cats! You could always compromise with your cat, too. If she likes the dog's food so much, crumble a piece over her food. That should make her happy. And think about her own food. If she eats the same thing all the time, maybe she's bored with it and would stay away from the dog's food if she had some variety. Hope this helps, Worried. Here's some more information about feeding cats from our human's website.